You'll be £50.00 closer to your next £10.00 credit when you purchase British Battleships of the Victorian Era. What's this? Order within the next 2 hours, 50 minutes to get your order processed the next working day! This is a companion volume to Friedman’ s highly successful British Battleship 1906–1946 and completes his study of the Royal Navy’s capital ships. Beginning with the earliest installation of steam machinery in ships of the line, the book traces the technological revolution that saw the introduction of iron hulls, armour plate, shell-firing guns and the eventual abandonment of sail as auxiliary propulsion. This hectic development finally settled down to a widely approved form of pre-dreadnought battleship, built in large numbers and culminating in the King Edward VII class. As with all of his work, Friedman is concerned to explain why as well as how and when these advances were made, and locates British ship design firmly within the larger context of international rivalries, domestic politics and economic constraints. The result is a sophisticated and enlightening overview of the Royal Navy’s battle fleet in the latter half of the nineteenth century. It is also well illustrated – a comprehensive gallery of photographs with in-depth captions is accompanied by specially commissioned plans of the important classes by A D Baker III, and a colour section featuring the original Admiralty draughts, including a spectacular double gatefold. Norman Friedman is one of the most highly regarded of all naval writers, with an avid following, so for anyone with an interest in warships, the publication of this work will be a major event. 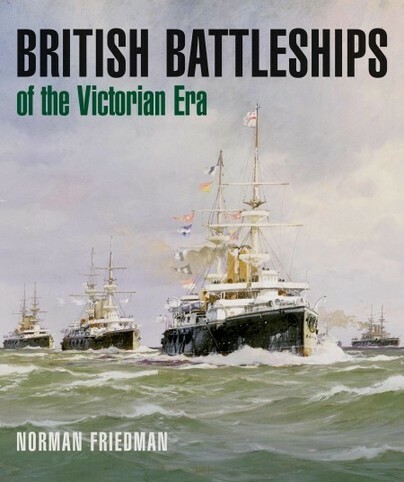 British Battleships of the Victorian Era is the "definitive" text on this subject and therefore falls rightfully among the milestones of naval publishing in every era and country. This prodigious work will be come a classic and it is most strongly recommended. The author of this superb volume is an influential American historian and analyst who has a long, sustained record of outstanding scholarship. A comprehensive and authoritative work, this is a magnificent addition to the author's previous publications and is of the highest quality - a pleasure to handle. There is much more to ‘British Battleships of the Victorian Era’ than your humble reviewer has managed to cover. He eschews the cliché praise words such as ‘magisterial’, ‘definitive’ etc. His recommendation to anyone who finds the maritime 19th century a source of fascination can rightly reward themselves by purchasing this quite splendid book. This book is a worthy addition to Friedman's acclaimed series of warship studies. Norman Friedman is a strategist known for his ability to meld historical, technical, and strategic factors in analyses of current problems. He has frequently appeared on television, and he has testified before the U.S. House of Representatives and Senate on naval topics. His forty books include, for Seaforth, two-volume histories of British cruisers and destroyers, a history of naval gunnery in the battleship era (Naval Firepower), a history of naval anti-aircraft gunnery during the two World Wars (Naval Anti-Aircraft Guns and Gunnery), World War I Naval Weapons, and, most recently, Fighting the Great War at Sea: Strategy, Tactics, and Technology. A history of British battleships is currently in preparation. All of these books are based largely on primary documents created by the Royal Navy and related organizations. As a result, they tend to shed new and sometimes surprising light on what might seem to be well-understood events and developments. All of them reflect Dr. Friedman’s interest in the way in which national strategy and policy and technology intersect. Dr. Friedman has also contributed articles on current naval technology to the annual Seaforth Naval Review. He wrote a series of design histories of U.S. warships, ranging from aircraft carriers to small combatants, based on U.S. Navy internal papers, five editions of a guide to world naval weapon systems, and accounts of trade-offs in warship (including submarine) design and naval radar technology. Other topics range from the role of space systems in naval warfare, the character of modern naval command and control (network-centric warfare), recent wars in Afghanistan and Iraq, to histories of the Cold War, to naval strategy and to naval technology, including the possible role of unmanned (but armed) aircraft in carrier operations. Dr. Friedman’s Cold War history, The Fifty Year War: Conflict and Strategy in the Cold War, won the 2001 Westminster Prize as the best military history book of the previous year, from the British Royal United Services Institute. To date he is the only American to have been so honored. His Seapower as Strategy won the Samuel Eliot Morrison prize awarded by the Naval Order of the United States in November 2001. After receiving a Ph.D. as a theoretical physicist at Columbia University, Dr. Friedman spent eleven years at a New York think tank, the Hudson Institute, headed by Herman Kahn, who was famous both as a futurologist and as a strategist. Much of his work there involved writing scenarios for possible future conflicts -- many in places which are still of great interest, such as Korea. Scenario-writing demands the ability to focus on the essentials of a situation, and on the forces likely to drive it. Dr. Friedman left Hudson as Deputy Director for National Security Studies. He then spent a decade as in-house consultant to the Secretary of the Navy. Among his projects for that office was a series of studies of likely future developments in various areas, beginning with the fundamentalist Muslim uprising then enveloping Algeria, and including likely developments around the Indian Ocean. Other projects included a contribution to the formulation of post Cold War U.S. naval strategy and participation in a study of the future of U.S. surface warships. Dr. Friedman served as futurologist for the U.S. Marine Corps headquarters in 2002-2004. In 2013 he wrote a history of the MRAP (Mine Resistant, Ambush Protected) vehicle program as a study in successful rapid (unconventional) procurement, under contract to the MRAP Joint Program Office. He has also written an official history of U.S. Navy air defense missile systems (including anti-ballistic missile systems). Topics Dr. Friedman has studied under contract to government agencies and to major government contractors have included the nature of future naval warfare, the defense transformation effort (as reflected in attempts to develop network-centric types of warfare), naval command and control as a model for network-centric warfare, the development of U.S. and British aircraft carriers (for the Naval Sea Systems Command and for the Office of Net Assessment, respectively, the latter as a study in defense transformation and the adoption of foreign innovations), missile defense, the future shape of the U.S.Marine Corps, the contribution of the U.S. Coast Guard to homeland defense, the future of the U.S. aerospace industry, the potential development of precision weapons, the U.S. industrial capacity for industrial mobilization, U.S. strategic targeting strategy and competitive policies, scenarios for conflict in Europe and Asia, the cost of current and future naval aircraft, nuclear proliferation (incentives and deterrents), prospects for torpedo countermeasures, the possible future shape of mine countermeasures, and the tactics of long-range anti-ship missiles, The naval missile study, conducted at the Naval War College, contributed towards the U.S. Navy’s technique for targeting anti-ship Tomahawk and was an early example of network-centric warfare. The paper which resulted from this study was said to have been very influential in the navy’s adoption of what amounted to network-centric concepts. Dr Friedman served on the 1989 U.S. Navy study of future surface combatant characteristics and later on a navy panel reviewing U.S. Navy R&D on ship hull and machinery topics. He gave the keynote address to a classified ONR meeting on the future of surface combatants, looking out 25 to 50 years and taking Moore’s Law into account in evaluating the likely prospects of stealthy ships. During 2010 Dr. Friedman contributed to a National Academy of Sciences study of the future of shipbuilding in the United States. Dr Friedman has lectured widely in forums such as the U.S. Naval War College, the Naval Postgraduate School, the Industrial College of the Armed Forces, the Air War College, the Australian , British, and Canadian junior and senior national staff colleges, the Royal United Services Institute, the British Ministry of Defence, and at a series of seminars for the Naval Air Systems Command managed by the University of Virginia. In the fall of 2002 Dr. Friedman served as the Royal Australian Navy’s Synott Professor, lecturing on seapower in several Australian cities. He was keynote speaker at Royal Australian Navy historical conferences, in 2009 on the theme of Commonwealth naval cooperation and in 2013 on World War I as a maritime war. In 2014 he was a keynote speaker at the Royal Navy Museum conference on the Anglo-German Naval Arms Race leading up to World War I. For some years Dr.Friedman was Visiting Professor of Operations Research at University College, London, concerned mainly with the formulation and consequences of ship operational requirements. For about thirty years Dr. Friedman has presented numerous commercial lectures (for defense and and naval professionals) on various defense topics. A hallmark of these lectures is their firm grounding in current international political and social trends, rather than simply in technology or in military considerations. Dr. Friedman writes a monthly column on world and naval affairs for the Proceedings of the U.S. Naval Institute. His writing has appeared widely in periodicals, including the Wall Street Journal, the Los Angeles Times, Naval Forces, Military Technology, Jane’s Navy International, Jane’s International Defence Review, Joint Forces Quarterly, Asia Pacific Defence Reporter, and Naval History.